If A Quiet And Modern Get Away Spot Is What You're Looking For You Found It! Stella’s cabin sits on sixteen acres with plenty of room to roam. There is cycling, hiking along the creek, it’s great for fly-fishing, kayaking in the spring, just relaxing by the fire pit with a good book sitting on the banks of the creek. The Quaint two-bedroom cedar siding cabin is only steps away from the creek. Its beautiful landscaping will have you forgetting your troubles and reconnecting with nature and loved ones. The cabin has a screened in porch with seating for that morning cup of coffee or a game of checkers overlooking the creek. The kitchen has a beautiful island that was built from timber harvested from the property and the appliances are top of the line with an industrial size stove, stainless steel refrigerator, dishwasher and microwave. What makes this cabin so special is the open concept floor plan great for entertaining guest inside or out. The furnishing's are comfy for a relaxing stay. The master bedroom has a rustic feel from the tin ceilings to the wood feature wall. There is a sliding door that leads you out to an open deck for a secluded place to sit and relax and listen to the tranquil water flowing. Upstairs there is a large open room that will accommodate several people with 2 twin size beds and a full size bed. It is perfect for a gathering! There is access to a televisions and a desk, you will find books throughout the house in different nooks, and board games in the entertainment center for a rainy day. We encourage you to explore and take a deep breath as you unwind at our little escape. Only six hundred feet off a quiet, paved highway and minutes away from the town of Ash Flat. Visit the old town of Hardy for some excellent antique shopping. Trey and I were raised in the delta of Arkansas, Trey graduated from Barton in 1995, I attended Marion High school. Trey and I both enjoy traveling and spending time with family. We have two girls one in college and a baby, they are 20 years apart! We work on the road traveling all over the country currently we are enjoying everything Texas has to offer. Trey and I looked at this property several years ago and this year when it became available we couldn't resist putting an offer in on it. 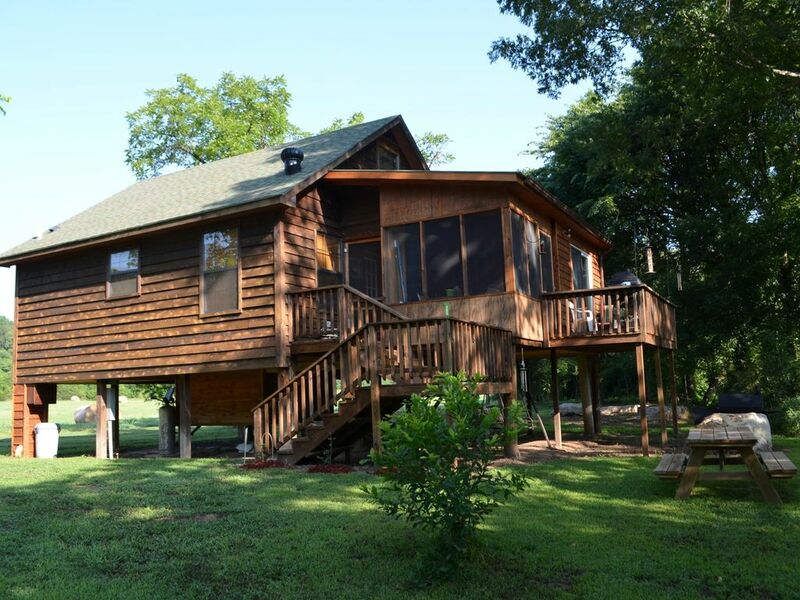 The cabin overlooks big creek has 16 acres of wildlife. It's a peaceful oasis to relax or have family and friends over for small gatherings. I just love walking through the property or fishing on the creek. It's secluded, but within a few minutes of town. We absolutely love the area, my personal opinion is its the prettiest areas in Sharp County. The seclusion away from it all makes this destination feel like a oasis. Town is only a few miles up the road which makes it convenient for shopping or other activities that might interest you. It's difficult for us to want to leave when there is so much to see or do right in our own back 16 acres. The layout of the land gives us so much creek frontage that we have multiple places to fish, swim, hike or just sit by the creek and reconnect with each other, watching wildlife, playing horseshoes, grilling out and roasting marshmallows. This is the Life! we have a cell phone booster for AT&T, we will add the numbers provided during your stay. We also have a land line for emergency's or for if someone should need to reach you. Love the cabin. So cozy! The creek was beautiful. We all had the best time. This was a 2nd visit for my sister and me, and we brought 2 friends. We're already talking about coming again--maybe in spring or summer. A wonderful, cozy place to get away from it all!! Hope you guys can get back for the warmer weather! The Spring is so nice in the summer it's the perfect temperature to dip your feet in or fishing in the creek. wonderful stay! Had some plumbing problems at the beginning, but owner responded and had them resolved within the hour. Will definitely be back in the spring/Summer! Everything is always perfect!!! Definitely will return! Me and the guys come here yearly for a getaway! Everything is always perfect! We love the privacy! Owners are just a call a way if you need anything!!! Wonderful cabin. So cozy. The cabin was absolutely perfect in every way. My sister and I loved Stella's Cabin. Just wonderful. Everything was perfect. Everything you needed was right there. You can even hear the creek running from the cabin. The perfect place to go when you need to get away from it all. The little town of Hardy is fun. We enjoyed the antique stores and even did some Christmas shopping. We are already planning on staying at the cabin again and bringing a couple of our friends! Thank you! We can’t wait to have you guys back! Happy Holidays! What a great cabin! If you are looking at staying in this area you must stay at this cabin! It was very clean and had everything we needed. The decor is very cabin feel and very comfortable. Kari and Trey have thought of everything to make your stay fun. From bikes to a kayak to a fire pit to board games and lots of DVD's. We caught lots of fish in the creek and enjoyed the porch listening to the water hitting the rocks. Thank you for sharing your cabin with us for a wonderful weekend. We will be back! Thank you for sharing your experience! We look forward to sharing our cabin with you again! Safe travels!